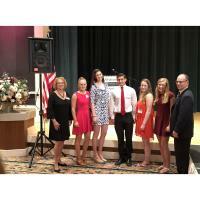 The Barrington Area Chamber of Commerce (BACC) awarded $4,000 in scholarships to seven local high school students during its Fashion Show and Scholarship Luncheon on Wednesday, May 23 at The Garlands of Barrington. “Each year BACC awards the Lauren Brown Memorial Scholarship to local high school students to help with expenses of higher education that builds future careers,” said BACC President and CEO Suzanne Corr. “The scholarships are awarded to students who will be attending universities, community colleges, vocational or trade school programs.” The scholarship is named after Lauren Brown, a lovely young woman who worked for the Chamber for several years and lost her battle with cancer at the age of 29. This year’s winners of the 2018 BACC Lauren Brown Memorial Scholarship are: Maggie Horak (planning to study business at the University of Illinois); Jacob Horcher (planning to study engineering at the University of Michigan); Mary Horcher (planning to study nursing at Illinois State University); Sarah Messerschmidt (planning to study German, international economics and cultural affairs at Valparaiso University); Payton Muhs (planning to study criminal justice and accounting at Western Illinois University); Tucker Priola (planning to study petroleum engineering at the University of Wyoming); and Eleanore van Marwijk Kooy (planning to study data science, economics and environmental sustainability at Duke University). “Lauren Brown Memorial Scholarships are funded by Chamber members through many Chamber events such as our BACC Golf Classic, our Annual Dinner and Silent Auction, and our Women’s Biz Net activities,” Corr said. The BACC Women’s Biz Net Shop/Sip/Socialize Girls’ Night Out event was held on April 26 at the Ice House Mall, and the BACC Golf Classic will be held on Monday, July 23 at The Club at Wynstone in North Barrington. The Chamber’s Annual Dinner and Silent Auction are held each January. PHOTO CAPTION: Pictured from left to right are: Suzanne Corr (BACC President/CEO); Scholarship winners Maggie Horak, Eleanore van Marwijk Kooy, Payton Muhs, Mary Horcher, Sarah Messerschmidt; and BACC Chair Tom Cramer (Wintrust Mortgage). Not pictured are scholarship winners Jacob Horcher and Tucker Priola.